The Ultimate Sales Proposal Dos and Don’ts. 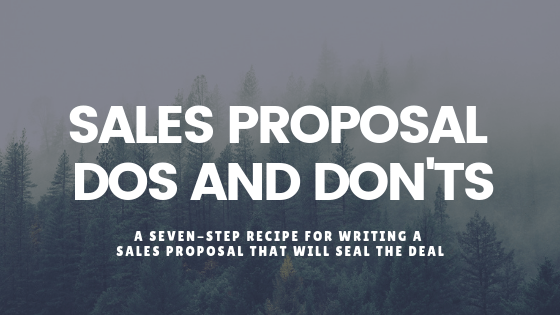 Finally, a seven-step recipe for writing a sales proposal that will seal the deal. Ever wonder how your sales proposal document could be your secret weapon to closing a deal? Well, writing a sales proposal that will close the deal is a skill that can be learned. But oftentimes we assume that the best looking proposals are the best-performing ones without understanding the content. Surely the first impression, in this case, the look and feel, is important. However, past research has shown that the content is equally, if not more, significant. By following a structure that resembles a delicious looking, moist and tasty piece of cake, writing a sales proposal that will close the deal can be, yes, you guessed it, a piece of cake (and yes, I cannot resist). The ultimate sales proposal that seals the deal. Follow this recipe to close more deals with an awesome sales proposal document. Use this checklist to help you write an awesome sales proposal. #1 Look at that eye candy. Always start with an appealing executive summary that leaves them hungry for more. The executive summary is the most important part of the entire proposal. It is your cake decor, the icing on the cake that makes you want to take a bite. Treat it as your personalized cover letter that will entice your prospect to consume the proposal in full. Do focus on the why. Even better, start with the why, as Simon Sinek would say. You want to the prospect’s problems and objectives. Address their challenges and why not overcoming it would be detrimental to the business. Do think about your tone. The feeling it should convey is that you are the expert and there is no one else who knows this better than you. Remember it’s how you say it, not what you say. Do refer to the prospect’s KPIs and metrics. Go back to your notes and find out how they are measured on. Articulate how your solution will help them achieve their KPIs. Do use the prospect’s own words. People like to hear or read about themselves. Say their name, department, company. Use exact words that they have used to describe their unique needs, pains, goals, etc. and you will make them feel respected and valued. After all, they took the time to tell you all that in the first call. Don’t talk about yourself or your solution. This comes later. Don’t detail the deliverables. Instead, focus on the outcomes and results. Explain why using the solution will solve the problems and get where they want to go. #2 Bite-sized pieces only, please. Perhaps this is obvious if you really were serving a cake, except that you are selling a solution. This step may seem a little overkill, as you have already presented the demo of the solution. But I guarantee you, by putting some effort into presenting the solution right, you will dramatically increase the probability of closing. It all boils down to the fact that we are visual animals. Visual gets into our head. Do focus on the why. Even better, start your sales proposal with the why, as Simon Sinek would say. You want to the prospect’s problems and objectives. Address their challenges and why not overcoming it would be detrimental to the business. Do use a visual representation of your solution. #3 An extra layer of frosting would be nice. In the next section, you are going to list your deliverables and reveal your pricing options in the sales proposal. The goal here is to give an opportunity for the prospect to consider a premium option. Many buyers are not aware of the options that are available to them, and they may have a deeper pocket that they have revealed to you. Do present more pricing options in the deliverable list. Make it easy for the prospect to consider the additional value they will get by paying a little more for a premium option. For example, extending the contract to another year, adding a license, or buying a value-added service such as training, custom webinar, etc. Do make the deliverable and pricing table interactive. Make it easy for the prospect to tick the additional option(s) they would like include in their package. The total amount of investments they will have to make by modifying the deliverables should be automatically updated or easily become available. Don’t present these options outside of the sales proposal. Many reps make the mistake of listing the options in the email. This means that when the prospect is inside the proposal, there is nothing to trigger his or her buying impulses. Lost opportunity. Don’t hide the discounts. Make it clear that you are giving a discount by showing the original price with a slash through it, showing the percentage of discount they are getting, or listing the saving amount in brackets beside the discounted price. Let your interactive product and pricing table do the selling. #4 No, your words are not the loudest. They say reference marketing is the most effective marketing. And it should be. Even if your prospects have already made up their mind, they will still want to have that extra reassurance that this is a solid investment. Remove all doubts and uncertainties to get to that yes. Do add before and after data. Take the time to browse through your case studies to identify any relevant ROI numbers. Do add only relevant customer testimonials or quotes. Make sure that it is a testimonial of a customer from the same industry or has the same professional role as the prospect. You want to make this relatable. Don’t overkill it. Two or three references should do the job. #5 Deal. Let’s shake on it. When people want to buy, they buy. Make it super easy for them to spend the money before they change their mind or before your competitors come knocking on the same door. Signing. Do make your proposal a contract. Your proposal will not only drive negotiation and the steps moving forward but will ultimately become the deal’s contractual agreement. Do make it ridiculously easy for the prospect to sign the proposal. This includes making it easy for them to forward the proposal and delegate signing right to their boss. Use e-signatures. And with that said, don’t make them print, sign, scan and email it back to you. That’s way too many steps for a potential customer. Do it mobile. Make sure your proposal is mobile-friendly. It has to be readable on mobile devices and the prospect can sign with a single tap on their mobile. Do make it easy for the prospect to engage. Give them a way to ping you instantly when they are reviewing the proposal. Don’t build long email thread. Make it easy for the prospect to suggest changes and comment on the proposal during the contract negotiation without having to email you back and forth. Email threads can be messy and may be impossible to track what’s been promised and what’s not. Don’t let it cool. Get back at any prospect interactions with your proposal fast, such as when they have opened it, read it, forwarded it, commented on it, etc. so that you’re there while it’s hot. #6 Never underestimate that finishing touches. A sales proposal that has the whole package takes into account the user experience in every context. Present it in a way that is impossible to resist. No matter when and where they are. Do put some effort into the layout and design. Add your company logo, brand images, use colors, margins, spacing, and more. Make it look expensive and professional. Don’t forget about mobile devices. With +100% increase of mobile’s share of web traffic during the last 2 years, and the fact that it is 2018 😉 ensure that your proposal looks absolutely stunning on mobile devices. Don’t attach contracts in an email. PDF proposal may be convenient to attach to an email but it does not look great on smartphones. Attaching agreements to an email also presents a risk to the GDPR but that’s an entirely different story that you can read more about here. Our pro tip will not only save you a lot of time so you can spend more time on selling, but it will also bring you closer to discovering the ultimate sales proposal format that will guarantee a signature. If you’ve gotten this far, you are a superstar. Do organize your sales proposal templates like a pro. Make sure you can track what works and what doesn’t so that you can ultimately repurpose and optimize only the best-performing ones. Do go through all your templates. Create a template for each service or solution that you offer and make it easy to personalize the proposal template. Do lock down sections that are a no-no to modifications by reps or prospects. Make sure you are in control of all outgoing contracts. Don’t leave your other systems out. Integrate sales proposal handling with your CRM (we use Salesforce) so that you can create proposal directly from your CRM using already available CRM data. Putting together a winning sales proposal takes effort and experience. However, it is the initial work that will take the most time. Using templates in Oneflow, for example, will allow you to create interactive web-based proposals directly in your web browser. Moreover, you can repurpose your best proposal templates for other uses, or even share them with other teams in your organization. All that will reduce the amount of time spent on managing proposals. Finally, remember to use this checklist before you send out your next proposal! And that is our recipe for writing a sales proposal that will seal the deal. We hope you find it useful and let us know how it goes. Did we miss anything? We’d love to hear from you.